The Los Angeles musicians and collaborators got real about Paak’s past projects and future endeavors. On Tuesday, Interview Magazine published a conversation between Anderson .Paak and Flying Lotus. The two Los Angeles musicians and soon-to-be collaborators discussed .Paak's indomitable presence in the last year, his dedication to the music, and what it's like working with Knxlwedge. The two started out by talking about how .Paak writes his lyrics, with .Paak revealing that he writes down whatever inspires him. "I just write everything down that is inspiring at the moment, because even if it's just a sentence or a word or a situation that happened, with my writing, I am a fan of wit and clever ways to say simple things." FlyLo was quick to show his immense respect for .Paak and the music he put out last year, saying, "I feel like there was no album that I cared about this year—well, maybe a couple—but there was, like, no album that I cared about that you weren't on." When speaking about the work he's put into his own artistry, .Paak said, "You know, I've never been one for sports, but with this music thing, I feel like I have the same kind of work ethic that athletes put into their professions." The two took the time to speak on .Paak's collaborative projects, namely his band the Free Nationals and his duo NxWorries, where he works with producer Knxwledge. 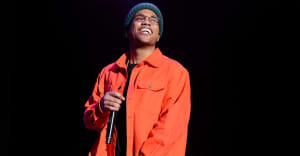 .Paak says that the Free Nationals are all good, and that he's been "getting their album together and seeing their potential, what they can do as a group, and making sure they're all straight." .Paak had more to say about Knxwledge, whom he credits with producing "one of my more cohesive pieces of work" with Yes Lawd! "It's like, you read about a lot of producers that are introverts, and Knxwledge is one of them. He's a little more comfy, but he's very much into his own thing and his own world, and I love that about him. He doesn't put on a face for nobody. He is who he is, and it's very refreshing for me to work with somebody like that." The two did not discuss their upcoming collaboration. The only details we have on that are that it exists and it's coming soon, as per the tweet below.